March 26, 27, 28, 29 & 30, 1985. Betty Dawes is a Founder Member of Wick and has been President for about ten years. Her achievements in Theatre have been numerous – from the infamous Emma Hornett in Sailor Beware to a fruity Widow Corney in Oliver. Betty is a keen member of The West Sussex County Players and also attends Lodge Hill Drama Weekends regularly to keep up to date with new ideas. Her wide experience in acting has led her increasingly towards directing for Wick [remember The Gingerbread Man?] and numerous Operas for Southwick Opera, including Il Trovatore. She also enjoys singing in the Chorus. After Anastasia, she directs Godspell at St,. Michael’s Church in July. Jean Porter trained for the Theatre in Lincolnshire under Drury Lane Professional. Drama has been her main interest after her family and she gained an Honours Diploma on moving to Sussex and taught Speech and Drama. Jean has had considerable success as a Director of plays, such as My Fair Lady, but prefers to act, nominating Amanda in Private Lives and Mrs. Erlynne in Lady Windermere’s Fan among her favourite rôles. Last year Jean played the Aunt in Ring Round the Moon and says she must get out of the habit of playing old ladies! However, she loves to research any part she plays – the Romanovs providing a temptation she could not resist. Hilary Wiltshire was the girl who put the ‘Kibosh on the Kaiser’ in Wick’s production of Oh! What a Lovely War in 1970. Since then she has played many memorable rôles for us such as Desdemona in Othello and Alais in The Lion in Winter. The Theatre has always been her great love and she is a dedicated perfectionist in all she does. She had a rest from the stage in the late ’70’s to have her three children and returned in 1983 to play Molly in Tom Jones. Hilary has also acted for Centre Stage, Lewes Little Theatre and Brighton Little Theatre. Neil Shephard’s first appearance for Wick was in Boeing-Boeing in 1969, after which he acted with distinction in about fifteen plays culminating in a towering performance as Iago in Othello. He then went to Algeria to teach for three years, Neil approaches his rôles very professionally and since returning has appeared in many productions including Rebecca and Blithe Spirit. In 1983 he received the Best Actor Award in the Southwick Festival. For his venture into direction, he chose Anouih’s Ring Round The Moon, which was runner-up in the 1984 Brighton Festival and won the award for the best setting. Neil has also acted for the New Venture Club and Gemini Players. NOT to be missed by any discerning theatre-goer is Wick Theatre Company’s production of Anastasia at the Barn Theatre, Southwick, on March 26 – 30. Believing Marcelle Maurette’s play to contain some of the best scenes ever written for the stage, Wick have assembled a star-studded cast, ranked as one of their best. The story, translated by Guy Bolton, hinges on one question. Could Anastasia have survived the horrific assassination of her father, Nicholas, the last Tsar of Russia and all her family in 1917? In our picture, left, by Herald photographer Gerald Thompson Anna Broun is seen as Hilary Wiltshire, with Ronald Cheesman as Boris Chernov and Anthony Muzzall as Peter Petrovsky. The curtain lifts on the post-revolution mystery at 7.45 p.m. on Tuesday, March 26, with performances on the four following nights. ALL the romance and fascination of Imperial Russia were reawakened at the Barn Theatre, Southwick, last Friday as Wick Theatre Company staged a colourful, gripping version of Marcelle Maurette’s Anastasia. First class standards of acting and tightly written script were the hallmarks of this production, which enthralled the audience from start to finish. It would be difficult to fault Wick for any aspect of this polished performance. Much credit must be given to Wick’s president and producer Betty Dawes. Not only did she ensure that the performers sparkled but the scenery, flowers and costumes were also impressive. Most of the play’s success rested on the uniform excellence of the performers. Giving a sensitive, mature performance was Hilary Wiltshire as Anastasia, alias Anna Broun, with deceptive ease she succeeded in transforming the downtrodden, consumptive peasant girl into a haughty, yet vulnerable, princess. 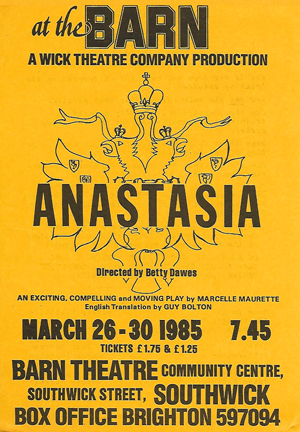 Although the audience never discovered whether she was Anastasia, or just a convincing fake, their imaginations were certainly caught by the interesting character. Another female star was Jean Porter as the Dowager Empress of Russia. She gave a towering performance of the indomitable old lady – brining out all the charm and steel, sympathy and sarcasm that was demanded of the part. Thrilled by these female performances, the audience also responded well to the fur leading male characters. Neil Shepard dominated the stage with a confident, energetic performance of the avaricious Prince Bounine. Equally commanding was talented Brian Moulton as Councillor Drivinitz. His English, spoken with Russian accent, was superb. Anthony Muzzall as the highly-strung artist and Ronald Cheesman as the ex-banker Boris Chernov, also gave sterling performances. Worthy of the highest praise were Irina [Joan Bearman], charwoman [Daphne Thornton], lady-in-waiting [Margaret Ockenden] and Prince Paul [David Creedon]. Not to be forgotten was the sympathetic, moving characterisation of the blind sleigh driver, played by Alan Upton. Last but not least, with an effective performance was Keith Denyer as the doctor.